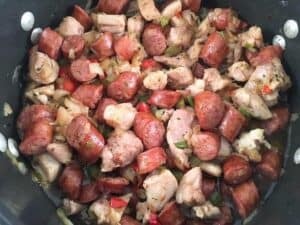 Chicken and Sausage Jambalaya is a family favorite! 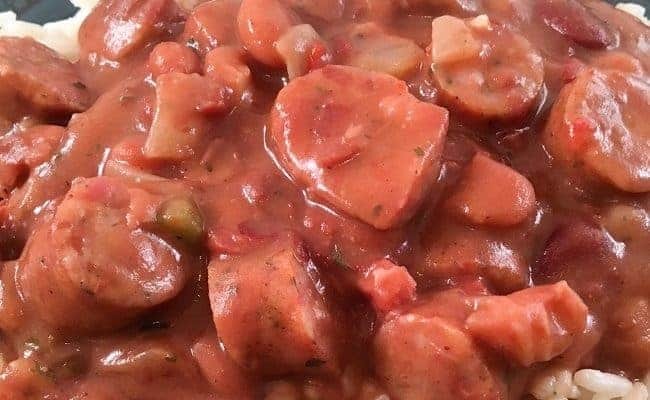 This authentic Cajun jambalaya recipe is simple to make and full of Cajun flavors. Mardi Gras wouldn’t be the same without this wonderful food! You’ll enjoy every spicy, savory, bite of chicken, sausage, rice, and the perfect blend of seasonings. Quick Note: This post may contain affiliate links. Please read my disclosure statement for details. Thank you. My family loves it when I make this jambalaya! It’s a special treat for them since I don’t make it near enough times; which is a shame because it’s super easy to make. Easy enough for a weeknight meal. Getting the ingredients laid out and prepped before you begin cooking makes it simpler. And, if you have a helper, then it’s even easier. My husband usually does all the chopping. This jambalaya is our family version. I tweaked the recipe a little, to make it my own version and to suit me and my family’s taste preferences. 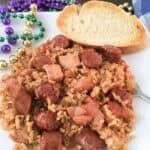 Enjoy this jambalaya for yourself and family or take it to a potluck supper, office lunch, or tailgate. Whatever the occasion is, this recipe won’t disappoint! We’ve received many requests for this one! Once you’ve sauteed the chicken, sausage, and trinity (what we call onions, bell peppers, and celery), the rest of the steps go really quick and easy. I recommend using a heavy 5-quart pot. I’ve been using the same pot for many years because the jambalaya always turns out perfect. Here’s the Calphalon pot that I use and love! Below is a picture of the chicken, sausage, and trinity that’s been simmered. After sauteeing the chicken, sausage and trinity, add the broth, tomatoes, seasonings and rice. Simmer covered for about 30-40 minutes. So delicious and worth the wait, I guarantee!! 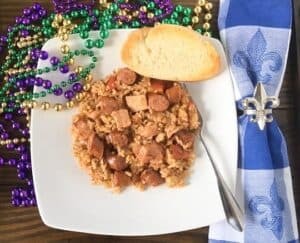 Serve this chicken and sausage jambalaya with buttered, toasted french bread and you’ve got yourself a winning authentic plate of Cajun bliss! 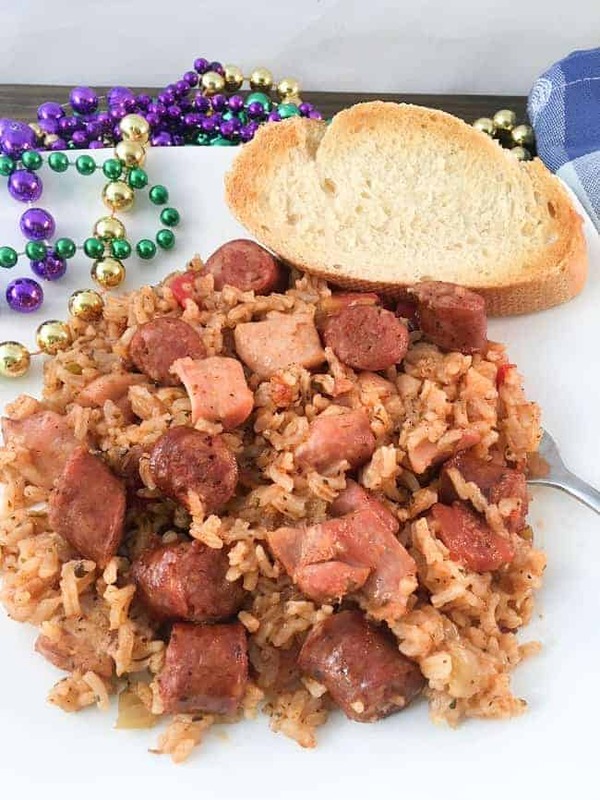 This jambalaya recipe is simple to make and full of Cajun flavors. You'll enjoy every spicy, savory, bite of chicken, sausage, rice, and the perfect blend of seasonings. In a heavy 5 qt saute pan, brown the cut up chicken that has been generously seasoned with Tony's (extra Tony's. This is not the amount in the ingredient list) in oil for 3-5 minutes. Do not cook the chicken through. Remove chicken from pot. Add the sliced sausage to the pot and brown for 5 minutes. Then add the onion, bell pepper, and celery. Mix well and scrape bottom of pan to remove and incorporate any browned pieces of chicken and sausage. Simmer covered for about 5 minutes, stirring halfway through cooking. Return chicken to pot and add the tomatoes, broth, and seasonings above. Mix well and taste for flavor. Add raw rice and mix well. Bring mixture to a boil, cover, and lower heat to medium-low. Simmer for 10 minutes and then stir mixture to bring rice to the top. Cover and lower heat (very gentle simmer) and cook another 30 minutes or until rice is done. Do not lift the lid while the jambalaya is cooking. Alternative Method. Recipe can be doubled and baked in the oven at 350 for 1 hour. The pan needs to be covered tightly with heavy duty aluminum foil. Recipe Note. Time-saving tip: You can use the frozen chopped onion, bell pepper, and celery. I promise, the recipe will still turn out fantastic! Please leave me a comment if you make this recipe. I’d love to hear from you. Anne and Steve this looks SOOO good! One of my faves really. True; I go veggie when I travel most of the time, since it is me and wifey and she does the veggie thing. But in the same regard, I need a little bit of meat here and there to energize myself, and to raise my iron levels too I believe. Feels like it at least. So jambalaya has that perfect mix of meat, protein, some saltiness and some world class satiating qualities that is right up my alley. Delicious!! Everybody wanted the recipe! I love how easy the recipe is and perfect seasoning. So happy to hear everyone enjoyed it!